Heather Wilcox, center, assistant director of CUBD, distributes candy as JSU supports the zoo’s fundraiser during Boo at the Zoo. She’s joined by two participants dressed as gypsies. 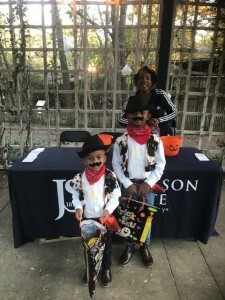 Carroll Frazier, administrative assistant/community outreach specialist for the Center of University-Based Development, provides treats to a couple of cowboys during Boo at the Zoo. 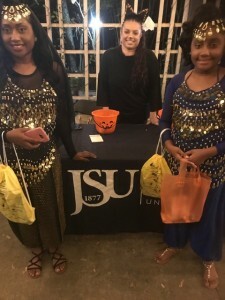 JSU’s Center for University-Based Development (CUBD) recently participated in the annual “Boo at the Zoo” fundraising event, passing out candy to children throughout the metro area. The two-night family-friendly extravaganza included numerous other vendors, too, who provided edible and non-edible treats. Entertainment consisted of Inky the Clown; Dorian the Magician; a haunted house and trail; food trucks; and animal encounters. Funds from the event support daily zoo operations. Because JSU aims to be a good neighbor and is designated as an urban university by the state legislature, CUBD originated to assist with the redevelopment of the one-mile area around the campus. As a result, CUBD has developed a number of community initiatives. These include its popular Crop Drop and the Mount Olive Cemetery restoration. JSU’s partnership with the community and its work with residents also benefit the HBCU. The collaboration allows JSU’s academic and educational units to influence culture in surrounding neighborhoods and to apply studies to life events.